Nothing too fancy about this one. 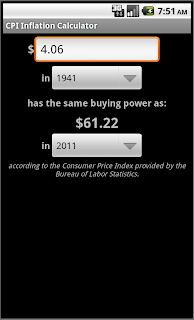 Just an inflation calculator based on the Consumer Price Index provided by the United States Bureau of Labor Statistics. New in version 1.0.1: Fixed an error where a rotation would cause the year field to reset.